Every dog owner wants to feed their pet the best food possible, and for many owners, this means opting for a natural dog food that is made without artificial ingredients. This is a laudable and obtainable goal, which may likely help improve the health of your pet. However, it is important to examine the issue carefully before diving into all natural dog food. Among other things, this means defining what “natural” means to you and educating yourself on some of the most common additives included in commercial foods. We’ll then list 10 of the best natural dog food options on the market. What Do We Mean by Natural Dog Food? The word “natural” gets thrown around a lot, and different people use it to mean different things. For our purposes, we are considering “natural” foods those that contain only easily identified and familiar ingredients and no artificial additives. Just keep in mind that plenty of “natural” things are harmful. Strychnine is as natural as it is deadly. The same could be said of castor beans, tomato leaves and apple seeds. Likewise, “artificial” things can be quite beneficial for your dog’s diet; chicken meal, for example, is chock full of protein and other important nutrients, but it obviously doesn’t occur naturally. So, the important thing for most owners seeking all natural dog foods is the presence of nutritious, whole, easily identified foods, and the absence of things like artificial flavors, artificial colors and artificial preservatives. Additionally, most owners seeking an all-natural diet are keen to avoid cheap fillers and low-value ingredients. Should You Buy or Should You Cook? There are two basic options for owners seeking the best natural food for their dogs. You can purchase a food that is mostly comprised of all natural ingredients, or you can make your own food, which will be entirely comprised of natural ingredients. There are a very small number of commercially produced dog foods that fit our definition of natural foods, and there are a few others that come very close to meeting this definition. These foods may be great options for owners who want to feed their dog as safe and natural a diet as possible, without having to go to the cost or expend the effort needed to prepare a homemade dog food diet. Additionally, most commercial foods are formulated to conform with the AAFCO guidelines for nutritional health, which means that you can just kick back and relax, comforted by the knowledge that your dog is receiving all of the vitamins and minerals he needs. You’ll also know that the relative protein, fat and carbohydrate portions are appropriate and that the mineral content of the food is properly balanced. A few manufacturers take things a step further in the quest for the most natural food possible, by formulating their recipes with raw, freeze-dried cuts of meat, instead of (or in addition to) cooked cuts. Many owners prefer these raw foods over cooked products, and because they are freeze dried, they’re not as likely to cause illness as raw, yet still hydrated, meats are. What About Homemade Dog Food Meals? Some owners are willing to go to the additional effort and expense to make their dog’s food at home. By doing so, they can be completely aware of every single item going into the recipe, and tweak them to suit their dog’s individual needs and preferences. 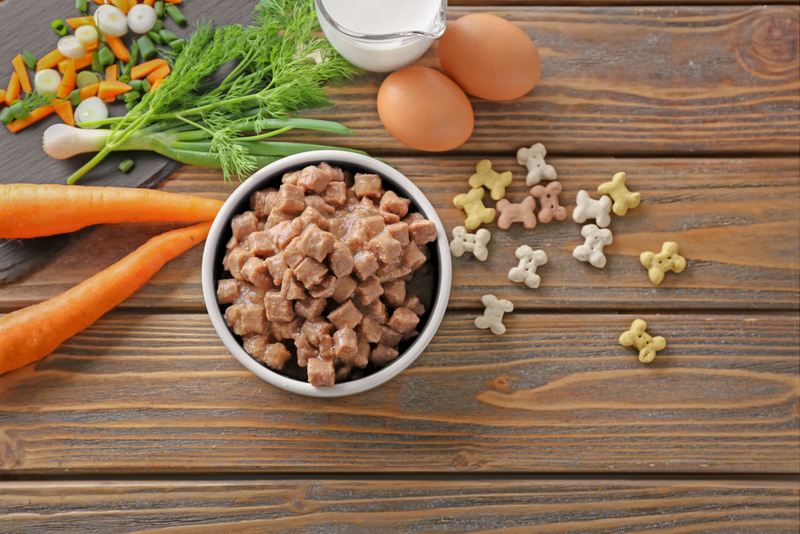 Most home-prepared, all natural dog foods are comprised of a basic protein (such as chicken breast), a nutritious carbohydrate (such as brown rice or sweet potatoes) and some fruits and vegetables for vitamin and mineral content. However, the nutritional content of the food must be balanced carefully to avoid causing long-term, developmental problems or deficiencies. At the end of the day, it comes down to this: If you are willing to put in the time and (considerable) effort to feed your pup homemade dog food, go for it. However, this is a significant commitment, which shouldn’t be taken lightly. If you don’t have the necessary dedication, energy and finances to pull off a homemade diet, just select one of the premium all-natural dog foods listed below. In the early 1990s, many dog owners began offering their dogs homemade meals, in which most or all of the items were uncooked. Often called the BARF (Biologically Appropriate Raw Food) diet, most meals would consist of a few fruits and vegetables, along with a healthy serving of ground bone and raw meat (including both muscle and organ meats). Many proponents report that the diet provides a wealth of health benefits, including improved digestive function, increased energy and a reduction in skin and coat problems. However, few of these benefits, if any, have been verified empirically. If raw foods were as safe as cooked foods, this may not matter – it may make sense to take a chance on the potential benefits provided, despite the lack of confirming evidence. But raw foods are not as safe for your dog as commercial foods. While it is true that dogs rarely fall sick to the common strains of Salmonella, Escherichia coli, and other stomach-sickening bugs that commonly infest raw meat and cause illness for humans, some dogs can and do become sick from the bacteria. In some cases, these poor dogs can suffer from very serious illness – death is even possible. Accordingly, the veterinary medical community typically discourages the feeding of raw meats. Many human doctors also discourage the practice, as it puts dog owners at increased risk of illness too (in fact, you are probably more likely than your dog to become sick from feeding your dog a raw diet). Fortunately, there is a nice compromise available: Dog foods with freeze-dried raw meats. Freeze-dried meats are still raw in every sense of the word, but they’ve had their moisture removed. Once dry, the meats won’t support nearly as many bacteria as fresh, raw meats will. This means that while freeze-dried foods aren’t quite as safe as cooked foods, they are much safer than traditional raw diets. What Are the Benefits of All Natural Dog Food? Natural dog foods do provide a number of important benefits, regardless of whether you purchase a commercial variety or cook up something in your own kitchen. Many dogs exhibit increased energy levels after switching to natural dog foods. Many dogs will stop experiencing food allergies after switching to natural dog foods. Many dogs will exhibit better coat and skin health after switching to natural dog foods. Some dogs enjoy less joint pain and inflammation after switching to natural dog foods. Are There Any Drawbacks to Natural Food for Dogs? While natural foods provide a number of benefits to dogs and their owners, they are not without their faults. These problems vary depending on whether you are talking about commercially produced or homemade varieties, so we’ll consider them separately. Commercially produced natural foods may still become tainted or contain unintended or mislabeled ingredients. You cannot alter the recipe easily to suit the needs of your dog. Commercial foods that best fit our definition of “natural” are typically quite expensive. If you’ve decided to go the commercial route to acquire your natural dog food, consider the following five. Each is sure to provide your dog with the nutrition he needs, without including a bunch of unnecessary artificial junk among the ingredients. We’ve listed five conventional, cooked foods first, and they are followed by five raw, freeze-dried options. All Fromm Recipes feature impressive ingredient lists, but when you are looking for a natural recipe, made almost entirely from very familiar ingredients, Fromm Four-Star Game Bird Recipe rises to the top. Made with several great proteins and plenty of nutritious fruits and vegetables, Fromm’s Game Bird Recipe is a great choice for owners seeking an all-natural dog food. User Reviews: Fromm products are almost universally praised, and owners love the ability to give their dog such a delicious all-natural food. Many owners note improvements in their dog’s coat condition and energy level, thanks to the omega-3 fatty acids present in the recipe, and most dogs seem to find it both palatable and easy to digest. Bottom Line: This food possesses all of the things you’d want from any good food, and most owners should find the vast majority of the ingredients list familiar. However, some owners may not like the inclusion of duck meal among the ingredients. Duck meal is a nutritious addition to most dog foods, but it is a processed ingredient. Precise Pet Holistic Complete Large Breed Recipe is an all-natural, delicious and nutritious food designed specifically for the needs of your large-breed puppy. In addition to premium chicken, this food contains a number of other great ingredients, including fish oils, cartilage and colorful fruits. Ingredients: Chicken, Chicken Meal, Ground Brown Rice, Oatmeal, Chicken Fat (preserved with Mixed Tocopherols and Ascorbyl Palmitate), Salmon Meal, Lamb Meal, Citrus Fiber, Rice Bran, Flaxseed, Dried Egg Product, Natural Flavor, Lecithin, Fat Product (natural source of omega-3 DHA from algae), Menhaden Fish Oil, Chicken Cartilage (source of Glucosamine and Chondroitin Sulfate), Dried Kelp, Peas, Dried Apples, Dried Carrots, Dried Cranberries, Dried Blueberries, Chamomile, Dandelion, Pepper. User Reviews: Many pet owners reported that their dog’s skin and coat problems subsided after switching to Precise Pet Holistic Complete. Dogs also appear to love this recipe’s taste. Although a few owners lamented the price of the food, most still found that it provided good value and is priced similarly to other high-quality foods. Bottom Line: As long as you don’t mind the inclusion of properly-identified meat meals in the recipe, you should give Precise Pet Holistic Complete serious consideration. You could find most of the other ingredients on the shelf at your local grocery store, it is well-reviewed and the taste appears to appeal to dogs. It does, however, lack probiotics, which is slightly disappointing. Wellness CORE Natural Grain-Free is a premium dog food, based around a variety of all-natural and nutritious ingredients. A grain-free recipe, Wellness CORE relies on peas and potatoes to supply the carbohydrate content, rather than corn, wheat or rice. Ingredients: Deboned Turkey, Turkey Meal, Chicken Meal, Peas, Potatoes, Dried Ground Potatoes, Chicken Fat (preserved with Mixed Tocopherols), Tomato Pomace, Chicken Liver, Natural Chicken Flavor, Flaxseed, Salmon Oil, Carrots, Sweet Potatoes, Kale, Broccoli, Spinach, Parsley, Apples, Blueberries, Vitamins [Vitamin E Supplement, Beta-Carotene, Niacin, d-Calcium Pantothenate, Vitamin A Supplement, Riboflavin, Vitamin D-3 Supplement, Vitamin B-12 Supplement, Pyridoxine Hydrochloride, Thiamine Mononitrate, Ascorbic Acid (Vitamin C), Biotin, Folic Acid], Minerals [Zinc Proteinate, Zinc Sulfate, Iron Proteinate, Ferrous Sulfate, Copper Sulfate, Copper Proteinate, Manganese Proteinate, Manganese Sulfate, Sodium Selenite, Calcium Iodate], Choline Chloride, Mixed Tocopherols added to preserve freshness, Glucosamine Hydrochloride, Chondroitin Sulfate, Taurine, Chicory Root Extract, Yucca schidigera Extract, Dried Lactobacillus plantarum Fermentation Product, Dried Enterococcus faecium Fermentation Product, Dried Lactobacillus casei Fermentation Product, Dried Lactobacillus acidophilus Fermentation Product, Rosemary Extract. User Reviews: Most owners who try Wellness Core Grain-Free rave about it. Most report that their dog loves the taste, and many explain that their dog’s coat and skin health have improved since making the switch. Negative reviews were almost entirely the result of shipping problems, damaged packaging or expiration-date issues, and these types of problems occur with every food. Bottom Line: Like all of the other foods in our review, Wellness Core does contain meat meals, which may turn off some owners. However, the rest of the ingredient list is quite attractive for owners looking for all-natural foods. It contains all of the bells and whistles you’d want, including antioxidant-rich fruits, omega-3-rich salmon oil and four different probiotics. Wellness CORE is a good option for most owners, although it does not specifically address the needs of large breeds. Blue Buffalo Wilderness Rocky Mountain Large Breed Recipe is an all-natural food designed to provide your dog with all of the things he needs and none of the things he doesn’t. Made with protein-rich beef, nutritious fruits and no grains, artificial colors or artificial flavors, this food is clearly among the best in the all-natural niche. Ingredients: Deboned Beef, Chicken Meal, Tapioca Starch, Peas, Pea Starch, Pea Protein, Menhaden Fish Meal (source of Omega 3 Fatty Acids), Pea Fiber, Natural Flavor, Flaxseed (source of Omega 6 Fatty Acids), Chicken Fat (preserved with Mixed Tocopherols), Potatoes, Fish Oil (source of EPA-Eicosapentaenoic Acid), Dehydrated Alfalfa Meal, Dicalcium Phosphate, Deboned Lamb, Deboned Venison, Potassium Chloride, Dried Chicory Root, Choline Chloride, Calcium Carbonate, DL-Methionine, Caramel Color, Salt, Taurine, preserved with Mixed Tocopherols, Sweet Potatoes, Carrots, Glucosamine Hydrochloride, L-Carnitine, Zinc Amino Acid Chelate, Zinc Sulfate, Ferrous Sulfate, Vitamin E Supplement, Iron Amino Acid Chelate, Blueberries, Cranberries, Barley Grass, Parsley, Yucca Schidigera Extract, Dried Kelp, Turmeric, Nicotinic Acid (Vitamin B3), Calcium Pantothenate (Vitamin B5), Oil of Rosemary, L-Ascorbyl-2-Polyphosphate (source of Vitamin C), L-Lysine, Copper Sulfate, Biotin (Vitamin B7), Vitamin A Supplement, Copper Amino Acid Chelate, Manganese Sulfate, Chondroitin Sulfate, Manganese Amino Acid Chelate, Thiamine Mononitrate (Vitamin B1), Riboflavin (Vitamin B2), Vitamin D3 Supplement, Vitamin B12 Supplement, Pyridoxine Hydrochloride (Vitamin B6), Calcium Iodate, Dried Yeast, Dried Enterococcus faecium fermentation product, Dried Lactobacillus acidophilus fermentation product, Dried Aspergillus niger fermentation extract, Dried Trichoderma longibrachiatum fermentation extract, Dried Bacillus subtilis fermentation extract, Folic Acid (Vitamin B9), Sodium Selenite. User Reviews: The majority of owners who tried Blue Buffalo Wilderness Large Breed became instant fans. Many owners noted improvements in their dog’s coat condition, joint health and digestive habits after switching to this food, and, like almost all Blue Buffalo Wilderness recipes, dogs appeared to love the taste. However, a few dogs did exhibit digestive difficulties after making the switch, but such reports were quite rare. Bottom Line: If you are interested in a grain-free, all-natural recipe that is fortified with probiotics, glucosamine, chondroitin and omega fatty acids, it is hard to look past Blue Buffalo Wilderness Large Breed Recipe. It is priced similarly to other foods in the category. Additionally, because it is specifically designed for large breed dogs, it has extra value for most Canine Weekly readers. Taste of the Wild Bison & Venison Recipe is designed to resemble the diets of wild canines. Packed with several different whole meats and supplemental protein sources, Taste of the Wild is made without grains, artificial additives or fillers. Ingredients: Bison, venison, lamb meal, chicken meal, egg product, sweet potatoes, peas, potatoes, canola oil, roasted bison, roasted venison, natural flavor, tomato pomace, ocean fish meal, choline chloride, dried chicory root, tomatoes, blueberries, raspberries, Yucca schidigera extract, Enterococcus faecium, Lactobacillus casei, Lactobacillus acidophilus, Saccharomyces cerevisiae fermentation solubles, dried Aspergillus oryzae fermentation extract, vitamin E supplement, iron proteinate, zinc proteinate, copper proteinate, ferrous sulfate, zinc sulfate, copper sulfate, potassium iodide, thiamine mononitrate (vitamin B1), manganese proteinate, manganous oxide, ascorbic acid, vitamin A supplement, biotin, calcium pantothenate, manganese sulfate, sodium selenite, pyridoxine hydrochloride (vitamin B6), vitamin B12 supplement, riboflavin (vitamin B2), vitamin D supplement, folic acid. User Reviews: The majority of owners were very pleased with Taste of the Wild. Several noted improved energy levels and coat health, and most dogs appear to love the food’s meaty taste. However, a few owners noted digestive problems after making the switch and several noted inconsistencies with regard to kibble size. However, kibble size is rarely a serious issue for large breed dogs. Bottom Line: A surprisingly affordable recipe, given its impressive ingredient list, Taste of the Wild offers excellent value for pet owners seeking an all-natural food. The bulk of the ingredient list is comprised of familiar items and it is made without artificial additives. Taste of the Wild deserves serious consideration by all dog owners, including those who have large breeds. Stella & Chewy’s Freeze-Dried Patties are designed to offer a convenient way to offer your dog a delicious food made with plenty of raw meat. Made with all of the meats, organs, bones, fruits and vegetables you’d want for your dog, these patties are nutritious, delicious and easy to prepare for your pet. User Reviews: Most owners who tried Stella & Chewy’s Freeze-Dried Dinner Patties were extremely pleased, noting that the food seemed to help improve their dog’s energy level, coat health and digestive function. Additionally, most dogs appear to love the taste of the food. However, a few owners did complain of finding large, potentially hazardous bone fragments in the food. This may give some owners pause, especially those with small dogs (who are more likely to be injured by relatively small pieces of bone than large dogs are). Bottom Line: Stella & Chewy’s Freeze-Dried Dinner Patties are a great option for owners seeking an easy way to provide their dog with a nutritious, organic and all-natural food. This recipe is packed with plenty of all-natural extras, including probiotics, which aren’t included in many other freeze-dried diets. It is somewhat expensive when compared to conventional foods, but it is more-or-less priced similarly to most other options in the raw food category. Wellness is well-known for their high-quality lineup (note that we recommended one of the recipes from their CORE line above), and TruFood Raw Dog Recipe fits right in with their other recipes. It is easily one of the best options in the raw-food category, being packed full of the types of delicious ingredients you’d want, with none of the ones that you don’t. Ingredients: Salmon, Salmon Meal, Peas, Tapioca Flour, Lentils, Chickpeas, Chicken Fat (preserved with Mixed Tocopherols), Turkey Liver, Flaxseed, Turkey Hearts, Tomato Pomace, Green Beans, Beets, Apples, Coconut Oil, Natural Flavor, Choline Chloride, Turmeric, Calcium Carbonate, Chia Seeds, Vitamin E Supplement, Zinc Proteinate, Spinach, Mixed Tocopherols added to preserve freshness, Broccoli, Ginger, Pumpkin, Parsley, Blueberries, Kale, Purple Carrots, Niacin, Iron Proteinate, Copper Proteinate, Thiamine Mononitrate, Vitamin A Supplement, Biotin, Pyridoxine Hydrochloride, Riboflavin, Vitamin D3 Supplement, Manganese Proteinate, Calcium Iodate, Sodium Selenite, Yucca schidigera Extract, Inulin, Folic Acid, Dried Lactobacillus plantarum Fermentation Product, Dried Enterococcus faecium Fermentation Product, Dried Lactobacillus casei Fermentation Product, Dried Lactobacillus acidophilus Fermentation Product, Dried Enterococcus thermophilus Fermentation Product, Dried Lactobacillus bulgaricus Fermentation Product, Rosemary Extract, Green Tea Extract, Spearmint Extract. User Reviews: The customer reviews for Wellness TruFood Raw Recipe were overwhelmingly positive. Most owners were very happy with both the quality of the food and the health benefits – including improved energy, coat health and digestive function – that it provides. Additionally, dogs – even those who tend to be picky — appear to love the taste of the recipe. However, as with virtually every other freeze-dried option in the category, the cost of the food was a frequently mentioned complaint by owners. Bottom Line: Of all the raw foods in our review, Wellness TruFood is the closest to a conventional dog food, so it is a good choice for those interested in experimenting with a freeze-dried recipe. It contains all of the things you’d want in any high-quality dog food, yet it is made without anything artificial or unnecessary. Additionally, because most dogs appear to find it palatable, this food is unlikely to go to waste. Most Orijen foods are primarily made from all-natural ingredients, and their Freeze-Dried Tundra Recipe is no exception. Made from a combination of different freeze-dried meats, organs, bones, fruits and vegetables, most dogs find the Tundra Recipe quite palatable. User Reviews: Most Orijen foods enjoy fantastic customer reviews, and their Freeze-Dried Tundra Recipe is no exception. Words like “great,” “excellent” and “best” are woven throughout most of the reviews, although a very small number of owners experienced problems with shipping or the product’s packaging. Freeze-Dried Tundra is an expensive food, but that is common to most raw foods and Orijen products in general. Bottom Line: While Orijen’s Freeze-Dried Tundra Recipe is packed with protein, it also includes a diverse array of nutritious fruits and vegetables, which both improve the food’s taste and increase its nutritional value. This makes the product a great option for owners who want to provide their dog with a meat-heavy diet, without completely ignoring the value of fruits and vegetables. It certainly isn’t a good option for cost-conscious owners, but it provides great value for those who can fit it within their budget. TruDog Real Meat Organic Dog Food is the perfect food for owners seeking a truly meat-based diet for their dog. Comprised almost solely (99%) of meat, organs or bones, TruDog is designed as a stand-alone food, but you can also add it to a bowl full of vegetables, fruits and brown rice, to provide a greater breadth of vitamins, minerals and antioxidants. User Reviews: The vast majority of dog owners who tried TruDog were very happy with their choice. Dogs appear to find the recipe very tasty, and many owners love the idea of giving their dog a diet comprised almost exclusively of animal-derived ingredients. However, several owners did complain about the expensive price tag. Bottom Line: Even among raw diets, TruDog is an expensive option; but this is to be expected, thanks to its meat-heavy composition. This will surely turn off some dog owners and send them looking elsewhere, but for those who are comfortable with the hefty price tag, TruDog Real Meat Organic Dog Food is a great option. “I and love and you” may be a bit of a puzzling name for a dog food, but you can get away with that when your recipe boasts such an impressive list of ingredients. Made without any grains, fillers or artificial ingredients, “I and love and you” is one of foods most deserving of the “all-natural” label. Ingredients: Lamb, Yellow Split Peas, Sweet Potato, Cabbage, Carrots, Whole Egg, Flaxseed Meal, Banana, Tricalcium-Phosphate, Almond meal, Spinach, Alfalfa, Kelp, Ginger Root, Salt, Zinc Sulfate, Iron (Ferrous Sulfate), Vitamin B12, B12 (Methylcobalamin). User Reviews: If you’ll pardon the pun, most users loved “I and love and you.” Several found that it helped their pup exhibit improved energy levels, and others were pleased with its ability to improve their dog’s coat condition. Most dogs found the food quite tasty. The only common complaint about the food was its high price tag. Bottom Line: “I and love and you” is a great choice for those who want a raw, all-natural food, which still contains plenty of other nutritious ingredients. It is somewhat expensive, like most other raw diets, but most owners reported being happy with the investment. Additionally, because of its low glycemic load, it may be a good option for diabetic dogs (just be sure to consult your veterinarian before making any substantial changes in your dog’s diet). DL-Methionine is an amino acid commonly included in foods with relatively light protein content. Choline chloride is an organic molecule that plays a vitamin-like role in your dog’s body. ​Taurine is a naturally occurring amino acid, commonly used to supplement dog foods. ​Mixed tocopherols are naturally occurring sources of Vitamin E compounds, which are often used as preservatives. ​Chicory (or chicory root extract) is a naturally occurring plant (Cichorium intybus) that works as a prebiotic. It is commonly included in many all-natural dog foods. ​Folic Acid is simply a water-soluble form of a vitamin B9. Sorbic Acid is a naturally occurring preservative that was originally harvested from unripe berries of the rowan tree (Sorbus aucuparia). It is widely regarded as safe and it breaks down rapidly, making it environmentally friendly too. Yucca schidigera is the scientific name for the Mojave yucca, a small flowering plant, whose fibers are incorporated into dog foods to reduce digestive odors. Probiotics are beneficial bacteria that are included in many all-natural dog foods to help regulate your dog’s digestive system, among other things. However, they are often identified by strain, and these names are sometimes daunting-looking. But that’s just because bacteria are referred to by their scientific name which is based on Greek and Latin words. Some of the most common probiotic strains include: Aspergillus oryzae, Lactobacillus acidophilus, Lactobacillus casei, Enterococcus faecium, Saccharomyces cerevisiae and Trichoderma longibrachiatum. Many people foods are bad for your dog – some are even dangerous. But there’s nothing inherently different from the food you normally eat and the food your dog would love to devour. They can encourage bad behavior from your dog. Many processed people foods are loaded with salt, sugar and other undesirable ingredients. Table scraps often pack a bunch of calories, which can lead to weight-gain. However, none of these three things are problematic for those feeding a properly balanced homemade diet. Although it doesn’t hurt that people food is often more delicious than dog food, the main reason dogs beg is because you feed them from your plate. Avoid this, and your dog is unlikely to become a beggar. When preparing food for your dog, you’ll use no salt or sugar, so you don’t have to worry about your dog suffering from the additives in your food. You may add healthy fats, but these (in the correct amounts) are great for your dog’s health. Finally, because your dog will only be eating the food provided to him, and not table scraps, you can calibrate the calories provided to keep him at a healthy body weight. You’ll essentially prepare your dog’s food the same way you prepare your own food. You’ll want to cook most of the ingredients used in the recipe, and treat the food with the same dedication to safety and hygiene you’d employ when making your own all-natural dog foods. Don’t provide your dog with questionable items or foods that have passed their expiration date. If it isn’t good enough for you, it isn’t good enough for your dog (seasoning preferences aside). If you are interested in feeding your dog a healthy, nutritious, all-natural food, but you want to keep the process as easy as possible, this recipe may be the best choice for you and your pet. If your dog loves salmon or you are trying to get him plenty of omega-3 fatty acids to support coat health, this salmon and potatoes recipe may be the best option for you. If you want your dog’s food to be as delicious as it is natural, this recipe will not disappoint. You will have to go to some effort to prepare the food, but you know your dog is worth it! Have you ever experimented with natural dog food? What convinced you to make the switch? Did you find it easy to prepare the diet? How did your vet feel about the switch? Most importantly, how did your dog’s behavior and health change after making the switch to an all natural dog food diet?